That first discussion gathered a small but lively group. Here are some (very partial) points that came out of the discussion. Léa reported about two initiatives in Paris around (re)sourcing used materials and producing renewable energy. There was some discussion as to what makes a self-organized initiative a commoning one. the city administration in Berlin is perceived as having a non-collaborative attitude and being a big hurdle in managing urban resources and services as commons. some working definition of the commons was used by Léa emphasizing the fact that commons are connected by an acting community organizing around a local resource. The discussion shown that various understandings of the commons coexist. It still not clear what are the urban specificities of urban commons. it was noted that the practice of commoning is very much one of learning about participative processes. commons are not automatically a good thing and commoning initiatives may create new dilemmas. The example of Foodsharing was mentionned as it creates (apart from its obvious benefits of course) some pressure on deciding who is collecting a limited amount of reclaimed food. Graffiti was also mentionned as being controversial: it can be considered by some as commons; for others clean walls are the commons. the gender issue was mentionned as being an important one for the commons movement. the issues of size was emphasized. Commons cannot be too big, otherwise communities cannot self-govern them and administration layers start to clutter the system. We should aim at replicating initiatives instead of making them grow. We decided to organize another meeting in the coming weeks trying to better connect with existing circles. Keep posted! The group posing at the end of our discussion. Thanks all for taking part and see you next time! Some questions to kick start the discussion: Can the urban commons be a rallying flag for urban grassroots reclaiming contested urban space in Berlin? Or is that just some academic discussion? What is the role of the local government? How can it switch from being the “enemy” to the “ally”? This session aimed to explore how different communities (urban gardening, co-working, up-cycling, squats, etc.) have seized (in practice or in their discourse) the concept of commons in the urban context with a particular focus on Paris and Berlin, and the emerging global research/activist community. 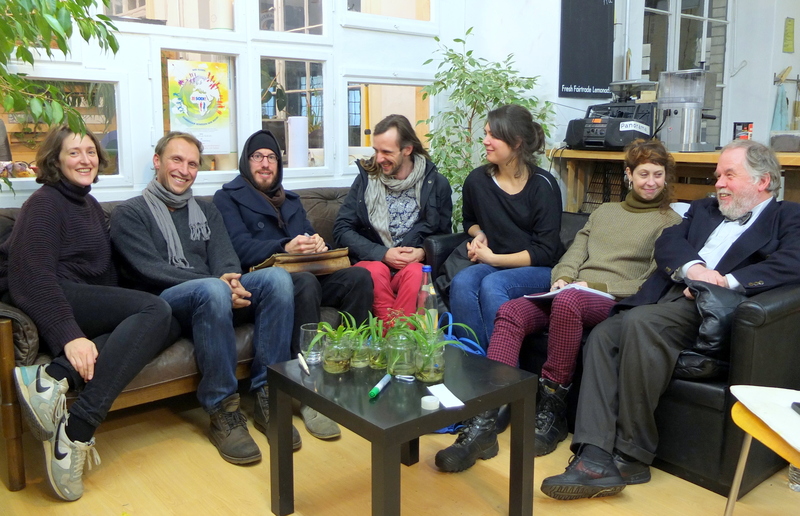 This was the occasion to gauge the potential for bringing together grassroots and other actors in Berlin around the collective promotion of urban commons as an overarching concept connecting various struggles around the contested use of urban space. The Transition Talks are an ad hoc series of talks followed by informal discussion around the theme of a transition towards more ecological and more collaborative cities and communities. This took place at the Thinkfarm Berlin | Oranienstraße 183 | 10999 Berlin | (3. Hof, Aufgang C, 3. OG). For more information please contact Adrien (adrienlabaeye[a]gmail.com or on Twitter @alabaeye).